Unquiet | Body is a work for two performers by Miami-based choreographer Heather Maloney with music by Juan Carlos Espinosa. The piece premiered on Friday, February 1, 2013 at Inkub8 in the Wynwood Arts District in Miami. The performers were John Beauregard and Joanne Barrett. John Beauregard has been a member of Karen Peterson and Dancers since 2000 performing in the Different Ability Festival in Capri, Italy and the Edinburgh Festival. 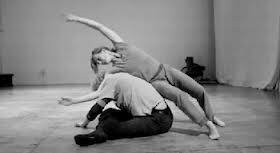 In 2004 John traveled to Cologne, Germany to work with German choreographer Gerda Kuing on a project commissioned by Tigertail. John has danced and collaborated with Heather Maloney since 2006. Joanne Barrett danced professionally in Europe and South America with the Michael Clark Dance Company. She has taught dance at various schools and universities. She has received commissions to create new works from the Miami Light Project, the Arsht Center for the Performing Arts, Tigertail, and the Karen Peterson and Dancers, among others. Janne is a practitioner and teacher of Ashtanga Yoga. Heather Maloney is a riveting performer, who draws on improvisational structures to create movement magic. She is a Miami-based choreographer, dancer and director of Inkub8. Her work has been presented at Bates Dance Festival, Florida Dance Festival, New World School of the Arts and in Fundanza Cumuna Venezula Performatica, Puebla Mexico, Fusebox, Austin TX. She has been awarded residen-cies at the Queens Museum of Art, New York (2003); at The Center For New Dance Development in Portland, Maine (2005); Recipient of the Manhattan Community Arts Fund/ New York City Department of Cultural Affairs (2004) NPN Residency through a Community Fund presenter Tigertail Productions (2004) NPN performance residency with Women and their Work Austin Texas (2008). She has been awarded the 2007 Miami Dade Choreographer’s Fellowship from the Miami Dade Cultural Affairs. Maloney was selected as an Emerging Choreographer for Bates Dance Festival 2008. In addition she has been awarded a 2009 Individual Art-ist Fellowship for Dance from the State of Florida Division of Cultural Affairs. She has taught workshops at New World School of the Arts, Bates College as well as in Brazil, Mexico, and Venezuela and currently is adjunct faculty at Florida International University. Espinosa and Maloney collaborated in creating Vertical Sprawl in 2012. The performance was presented by Tigertail as part of its 2012-2013 season and by the Florida Dance Association. The evening also included several films by of Victoria Marks. Two selections from the piece.